Simple, no fuss food can be a little fancy too. 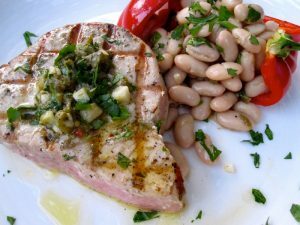 The brightness of the gremolata is a perfect accent for tuna. This was a quick weeknight meal to throw together but would be quite a showstopper for special company. For the bean salad – combine all dressing ingredients in a bowl and mix. Toss with beans. Set aside at room temperature. Preheat a griddle pan until smoking hot then reduce the heat to medium-high. In a medium size bowl, whisk the oil with the water until thick and creamy. Whisk in the lemon juice with a few pinches of salt and pepper. Stir in the garlic, capers, chillies and parsley. Lightly brush the tuna steaks and bell peppers with the spicy dressing and cook on the preheated griddle pan for 2 minutes on each side (for medium rare tuna). To serve, fill the grilled peppers with the bean salad. Place the tuna on the place and drizzle over the gremolata dressing. Enchiladas are one of those things I never order at a Mexican restaurant. I always want fish tacos or some special of the day – but I do love to make them at home and these are pretty simple to throw together. Overall these enchiladas are a pretty healthy meal if you use light sour cream and are light handed on the cheese. 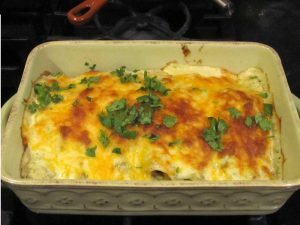 I opted to use real Mexican sour cream (crema) and I was a little generous with the cheese… but how often do you make homemade enchiladas? Go all out. If you are looking for a spicier dish try the homemade Verde Salsa from a Mexican grocery store. My verde salsa was HOT. To counteract the heat I served a salad dressed with Hot Pepper Jelly vinaigrette (jelly, lime juice, coriander, olive oil) and it was the perfect sweetness with the hot enchiladas. Combine the spices (first 5 ingredients) in small bowl and set aside. Toss sweet potatoes with 1/2 of the spice mixture & 2 tablespoons vegetable oil; toss to coat. Transfer to prepared baking sheet. Roast sweet potatoes until soft and browned in spots, turning occasionally, 20 minutes. Cool. DO AHEAD: Can be prepared 4 hours ahead. Let stand at room temperature. In a skillet over medium heat add 2 tablespoons oil. Add onion, corn and the remaining 1/2 of the spice mixture. Cook until onions and corn are caramelized about 8 minutes. 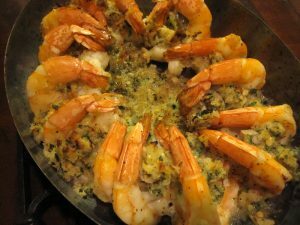 Add the garlic and shrimp and cook for an additional 2-3 minutes until shrimp are beginning to turn pink. Remove from heat. NOTE: Do not cook the shrimp completely as they will be overcooked once in the oven. In a large bowl combine shrimp & corn mixture with the sweet potatoes. Add in ½ cup chopped cilantro and toss to combine all ingredients. Season filling to taste with salt and pepper. Lower the oven to 375°F. Spray a 15 x 10 x 2-inch glass baking dish with non-stick cooking spay or vegetable oil. Wrap four tortillas in damp paper towels. Microwave 30 seconds. Spoon 1/4 cup shrimp mixture on each. Roll up and place seam-side down in prepared dish. Repeat with remaining tortillas and filling. Top with any extra filling. Mix salsa and crema and 1/2 cup cilantro. Spoon over enchiladas. Sprinkle with cheese. Bake at 375 degrees F, uncovered, for 15 minutes or until bubbly. Yield: 4 -6 servings. Anne Burrell is brilliant and can break down some difficult looking prep and make it SIMPLE. For instance, making fish scales out of potatoes. Mine didn’t turn out as beautiful as her perfectly potato crusted fish scales… but it was dead simple to do. 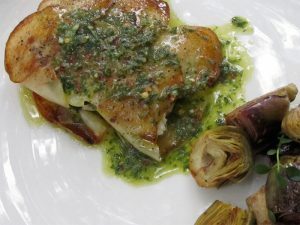 Her original recipe called for an infused oil to cook the fish in… but my basil was begging to become pesto and the fresh herbs with the meaty potatoes & fish was a delicious thing to eat. Word to the wise: If you don’t have a mandolin… don’t even bother with this recipe. Cook’s Note: In this case it is important to work quickly and to slice the potatoes for 1 halibut fillet at a time. We are NOT going to soak the potatoes in water, this will help them maintain their starch so they will stick to each other and to the fish, but could cause them to turn brown. Using a mandoline, slice 1 potato extremely thin, (paper thin), in elongated rounds. Lay a piece of parchment paper on a clean, dry work surface. Arrange 3 potato slices in an overlapping vertical line pressing them together as you put them on the parchment. Repeat this process until you have a 4 by 6-inch overlapping potato rectangle that replicates fish scales. Brush the potato “scales” with olive oil and sprinkle with salt. Season the halibut with salt. Lay the halibut fillet closer to 1 end of the potato rectangle than the other and then roll the fish up in the potato slices, using the parchment to help facilitate the rolling. Press to compact and really adhere the potatoes to the fish. Brush the outside of the potatoes with olive oil to seal the potatoes and to prevent the potatoes from turning brown, this will also help make a nice tight “fish package”. Reserve the fish in the refrigerator while preparing the remaining fillets. Refrigerate the fillets for at least 1 hour before cooking. 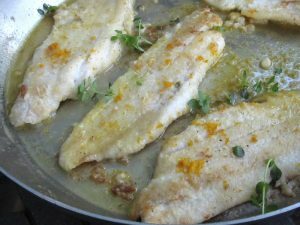 To cook the fish: Add olive oil to a large nonstick saute pan until the bottom is generously covered and bring the pan to a medium-high heat. Season the fish with salt and add to the pan. Cook the fish on both sides for 3 to 4 minutes frequently spooning the excess oil over the fish to “baste” it. The potatoes should be crispy golden brown and very well flavored and the fish will be succulent inside its crispy “scales”. Transfer to serving plates, top with pesto and serve. This meal has been in my head since the Maple Chipotle Corn went in my mouth. It was more delicious than I had imagined and is a perfect balance of sweet and spicy that brings a new life to salmon. I never attempt to flip fish on an outdoor grill… it just never works out for me. So I forget the showpiece grill lines and take the chance my fish will stay in one piece. Simply close the lid and let it cook skin side down and you will have a perfect piece of salmon. Season the salmon with salt and pepper. Rub some olive oil on the skin to keep it from sticking. Preheat grill (I prefer outdoor gas grill) over medium heat. When grill is hot reduce flame to medium-low and place salmon on the grill skin side down. 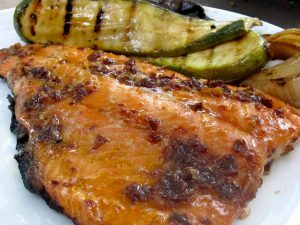 Baste salmon with the glaze several times throughout grilling (closing the lid for 2-3 minute intervals). Do not flip the salmon! It will cook through in 8 -10 minutes, depending on the thickness of the fish. Well not quite Dallas… but Rockwall is a small trip worth taking for the menu Restaurant Ava so skillfully serves up. Chef Randall Copeland is brilliant and his tenure at Bolsa makes him a shoe in for tastefully putting it on the table. The choices for the evening: Possibly the best spinach salad I’ve had in ages – the balsamic dressing is killer. Creamy risotto with morels – you want more? How about perfectly seared diver scallops on a bed of creamy potatoes and roasted vegetables? This was the inspiration behind my seared scallops with my favorite citrus – meyer lemons. Yes, I still have plenty of the beauties in the kitchen and am proud I’ve managed to stay away from making lemon bars. The meal didn’t end there. The spring pasta (homemade I may add) with lobster and pesto was equally delicious. And lets not forget the finale… the s’more brownie covered in homemade marshmallow and peanut butter ice cream. The dinner was excellent and the company even better (love it when they like to share). Restaurant Ava is a treat you should indulge in. I loved it all. 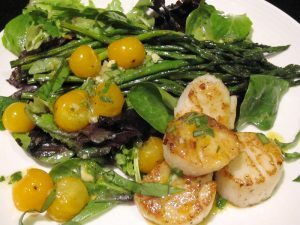 Make the vinaigrette, but substitute the herbs de provence with fresh tarragon or basil. Pat scallops dry with a paper towel and season both sides with salt and pepper. Tip: Moisture can keep the scallops from getting that golden crust, so be sure to not skip this step. Heat skillet over high heat for 2 minutes. Lower heat to medium and add a drizzle of olive oil or a tablespoon of butter. Add scallops to the pan and DO NOT TOUCH for 2 minutes. When they are ready to be turned they will easily release from the pan. If not – be patient they aren’t ready. Serve with mixed greens, roasted vegetables and top with the meyer lemon vinaigrette. 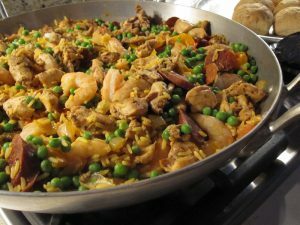 The aromas alone are worth giving this dish a try. When you take your first bite you will be sold. The flavors are not overpowering. 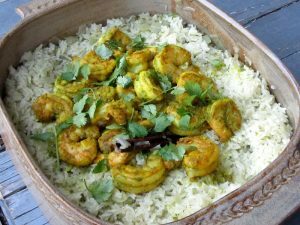 They are subtle with a perfect balance of spice and sweetness from the shrimp and onions. My friend Catherine of Fish and Veggies recommended this dish and passed on some great advice: put the whole spices in a cheesecloth sachet to avoid biting down on a whole peppercorn or clove. Peel the ginger and garlic and use a food processor to blend it to a paste with the cilantro and chilis. You can use a little water if it is too dry. Heat the oil on medium in an oven safe dish. Add the peppercorns, cloves, cardamom and 1 bay leaf to a sachet of cheesecloth and tie securely. Add the sachet to the oil with the cinnamon stick and saute until fragrant, approximately 2-3 minutes. Add the rice to the boiling water and add the butter and mint. Bring this to a boil, cover and place it in the oven. Bake for 20 minutes. When the rice has been in the oven for about 10 minutes heat some oil in a saute pan and add the remainder of the paste along with the other bay leaf. Saute this for a minute or two and add the shrimp. Saute the shrimp until done (they should be light pink) about 5 minutes. Remove the rice from the oven and remove the spice sachet and cinnamon stick. Top it with the shrimp and serve. Penzeys Spices is an incredible store with an abundance of fresh herbs, spices and original blends. Penzeys’ storefronts are a rare find. Dallas is 1 of 2 lucky cities in Texas to have a store to walk in and be wowed by the many jars full of intoxicating aromas. They also have an online store and catalog. “Sunny Paris” is a perfect name for a blend of shallots, green peppercorns, French basil, French tarragon, chervil, bay & dill… it smells warm. This is not a cheap blend of spices and history has it they actually stopped producing it due to it’s hefty cost. Thankfully the fans spoke and it’s back on the shelves. It is wonderful sprinkled on top of egg or in a dressing and such a warm flavor for fish. If you are in Dallas head to Penzeys and peruse their incredible variety of cinnamon from around the globe, original spice blends and pick up a few vanilla beans from Madagascar at a bargain price. A special thank you to my great friend JEN L for the introduction to Penzeys and sharing your Sunny Paris with me. In a small bowl combine breadcrumbs, lemon zest, salt, pepper and Penzeys Sunny Paris spice blend. Cut cod into 2 equal pieces. Pat dry with paper towel to remove any moisture and season both sides with salt & pepper and sprinkle ¼ tsp of Sunny Paris on each serving. Brush one side with Dijon mustard and top with breadcrumb mixture. Preheat 1 tablespoon of olive oil in a nonstick skillet over medium high heat. Add fish fillets and cook for 1 minute. Drizzle top of fish with a little olive oil and bake in oven for 5 minutes, or until fish is firm and done. Meanwhile, heat a thin layer of olive oil in a small saucepan or skillet. When hot add capers and fry until crispy – about 2-3 minutes. Place on paper towel to drain. Note: STAND BACK – they will pop. 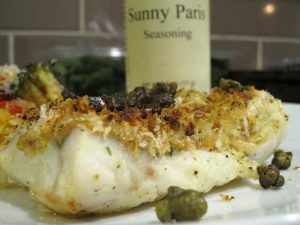 Remove fish from oven and top with crispy capers and fresh lemon juice.